The 2001 World Rally Championship was the 29th season of the FIA World Rally Championship (WRC). In a tightly contested year, Subaru's Richard Burns took his first and only drivers' world title, beating Ford's Colin McRae, Mitsubishi's Tommi Mäkinen and the defending champion Marcus Grönholm of Peugeot. Peugeot successfully defended their manufacturers' title. Eventual champion Richard Burns driving a Subaru Impreza WRC at the 2001 Rally Finland. Colin McRae finished runner-up in a Ford Focus RS WRC 01. 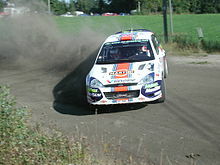 Wikimedia Commons has media related to 2001 in World Rally Championship. ^ "Burns crowned World Rally champion". RTÉ. 25 November 2001. Retrieved 16 June 2011.